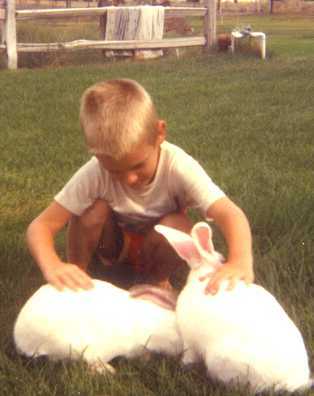 Soon after moving to Washington our family noticed that living out in farm country had some benefits, such as peace and quiet, and the kids would think twice before running away from home. But, there were some negatives, like lots of little critters such a spiders, snakes, and particularly mice. The house wasn't tightened up very well and mice were seen frequently scampering around various rooms. After putting in new rugs and flooring and spraying foam into walls, along with caulking every crack, most of the problem was solved. But, we still found mice in the traps. Jared was very pleased when we searched for our first mouse catcher cat. Mom was very worried that Jared might have an affinity to cats because of the "cat swimming" incident, (mentioned previously). 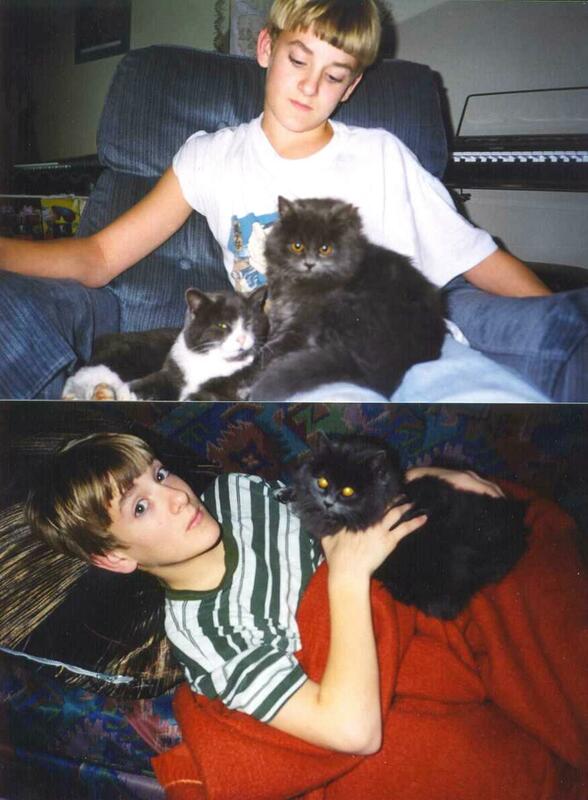 But Jared was naturally a cat lover and always had to have a cat of his own from that time on. It was not uncommon for irresponsible people to dump their unwanted cats out in the desert and farm area's near where we lived. We knew that many were eaten by coyotes that roamed in large numbers near our house. Whenever possible, we would adopt them before they could become a snack. Unfortunately, many cats were killed by roaming dogs at night or hit on a well traveled road near our house. To solve some of the problems keeping our cats alive, we made a most unusual cat house. A small but very long box was painted white and Jared and each member of the family drew cats of various kinds on top of the long box. Whenever the cats were chased they ran for their box and were saved because dogs couldn't enter without getting stuck, or their noses scratched off. 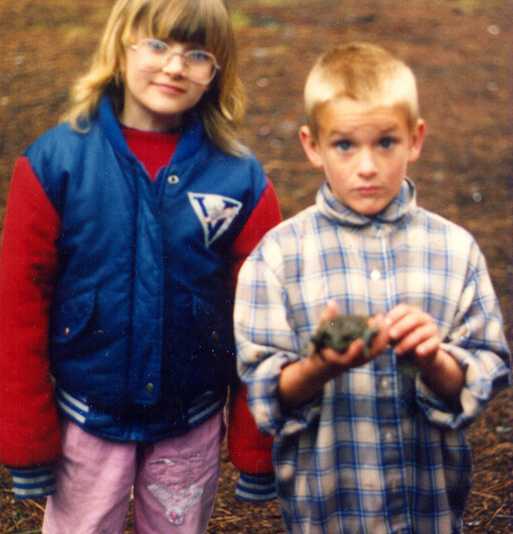 When Jared was about seven years old, he spotted a stray cat near our house that someone had dumped. 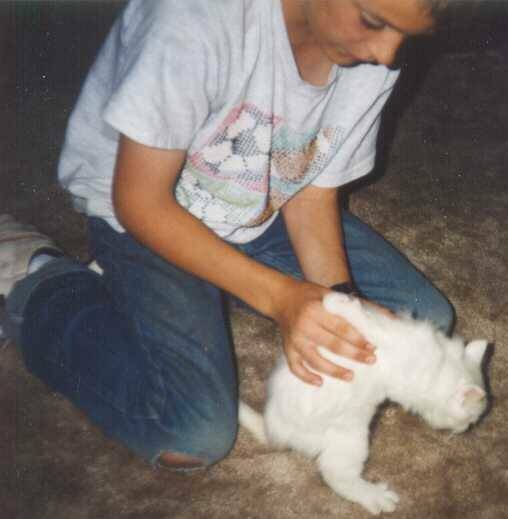 Usually Jared was able to befriend just about any cat but this one was a very wild kitty, and he couldn't get near it. His older brother, Jacob, thought he'd give it a try and was able to catch the wild cat, at least for a couple of seconds before getting scratched pretty badly. Later in the day, Jared got mad at Jacob for something he had done to him, so Jared commented to Jacob, "Why don't you go out and find that cat again!" The whole family just roared with laughter at this comment and we quickly came to realized that Jared had a very funny sense of humor. When we lost a cat or kitten, Jared and his sisters would have a little funeral for their pet. In an early spring morning, when Jared was in 5th grade, it was discovered, before the school bus came, that a very special cat and beloved pet of Jared's, was killed on the country road near our house. Jared tried very hard to be brave and went to the road, put his beautiful white, long-haired cat in a box, brought him home, and laid him in the garage. Jared, his sisters, and a couple of friends, had a funeral later in the afternoon after school and they buried him in a safe spot in the back garden. 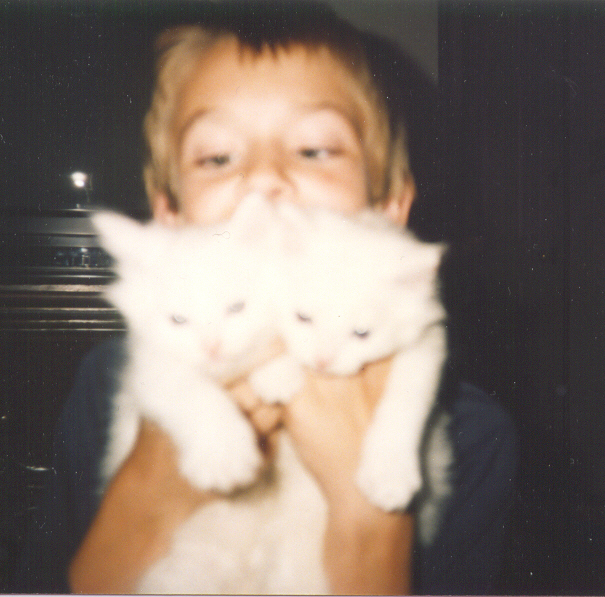 Everyone knew how much love Jared had for his beloved white cat and Jared's kindly school bus driver, who had asked a friend to call us after seeing Jared's cat on the side of the road (from the earlier bus route), stopped by our house to ask if he could get another cat for Jared. Jared seemed enthusiastic to take on a new cat friend so we agreed. This was a really skinny cat! Imagine mom's surprise when three weeks after adopting her she started dropping new-born kittens on the porch. Soon Jared had six kittens and a mother cat to take care of. Although Dad and Mom were shocked, Jared just loved his new responsibility as the "kitten dad". Jared and his sisters found good homes for all of the kittens except one, which mom kept. Although "Bandit" was considered a family pet, there is no doubt that Bandit believed he belonged to Jared because Jared loved to play with her and spend time running her with the 4-wheeler. It was also Jared's job, after he turned twelve, to be sure Bandit was fed and watered everyday. When Bandit came to our home she was just a little puppy, hardly old enough to be weaned from her mother. Bandit cried when we left her alone outside so we thought, why not put her in with the cats. Believe it or not, Bandit was treated very well by the dominant mother cat, named Calley, and so Bandit spent the first three or four weeks at her new home sleeping in the garage with Calley and her kittens. We began to think that Bandit thought she was a kitten because she enjoyed their company so much. .. When Bandit was tied outside and given her own doghouse Bandit was very lonely, and cried and barked a lot. But, amazingly, we noticed the Calley cat would come and sleep with her inside her doghouse and this seemed to help Bandit accept her new home. Calley and the other cats were befriended by Bandit. She often barked to warn her cat friends of approaching neighbor dogs or other dangers and she really got upset when her cat friends were hurt or were in cat fights with other stray cats. 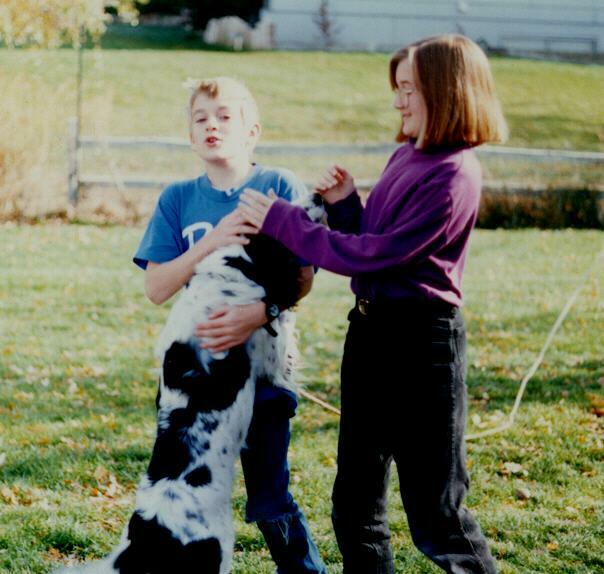 Bandit died in the Spring of 2003 and we haven't felt like getting another dog since. Once, Jared's cat got lost and he searched through the desert in front of the house for hours but couldn't find him, so he decided to pray and ask his Father in Heaven to help him. It wasn't long before his prayers were answered and his cat came home. It was a rule of our house that all animals, including cats, had to be outside and not in the house. Therefore, Jared had to sneak the cat(s) into the house to play with them without getting caught, which he was pretty good at. Sometimes we would find a cat in his bedroom sleeping cozy with him in his bed. Since mom also broke the rule occasionally, no one got in much trouble. Jared loved to lay and watch TV with a cat purring on his stomach. 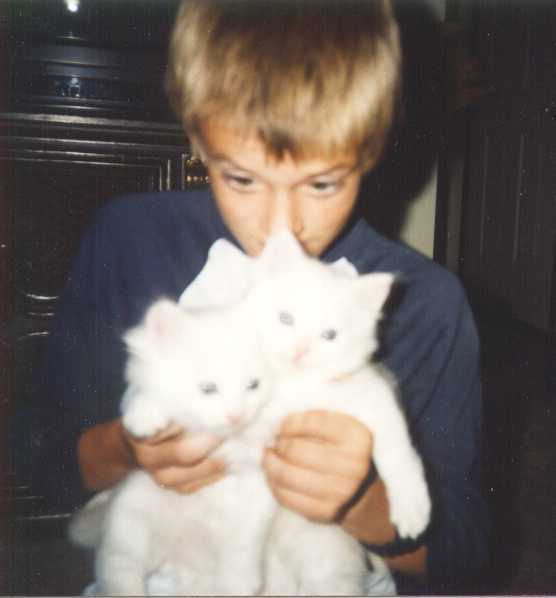 (See photo of Jared and his Cats) As time went by, the cats outside rule, was relaxed just for Jared because he really enjoyed giving and receiving love and companionship from his cats.